After it leaves the lungs, arteries carry oxygen-rich blood to every part of your body to provide the nourishment it needs. After delivering this oxygen and nutrients, your veins carry blood back toward the heart to get more oxygen in the lungs. Your leg muscles help to pump blood back to the heart against gravity. Leg veins have one-way valves, like a check valve or one-way door that keep blood flowing in the proper direction toward the heart. 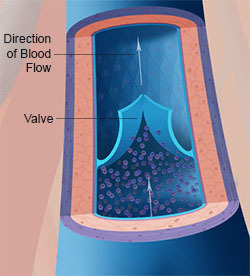 The valves shut briefly to prevent blood from flowing back toward your feet (pooling).